Welcome to the Midnight Gang! Midnight is the time when all children are fast asleep, except of course for… the Midnight Gang. That is when their adventures are just beginning…When Tom gets hit on the head by a cricket ball, he finds himself at Lord Funt Hospital, and is greeted by a terrifying-looking porter. 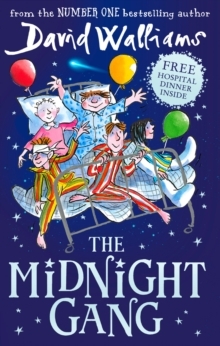 Things go from bad to worse when he meets the wicked matron in charge of the children’s ward… But Tom is about to embark on the most thrilling journey of a lifetime!The Midnight Gang tells an extraordinarily heartwarming and, of course, funny story of five children on a hospital ward – and on a quest for adventure! It is a story of friendship and magic – and of making dreams come true. Readers are set to be utterly spellbound by this heartfelt story that will bring magic to everyone’s Christmas.